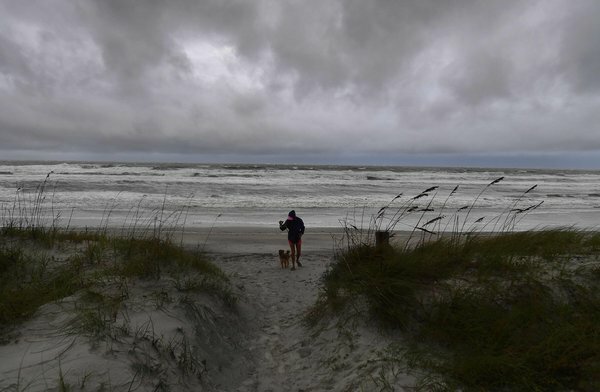 Taking aim at central Florida’s Atlantic coast, Hurricane Matthew intensified Thursday morning into a Category 4 storm with winds of at least 140 miles per hour and strengthening. The storm was blamed for the deaths of 100 people in Haiti. “Extremely dangerous, life-threatening weather conditions are forecast in the next 24 hours,” the National Weather Service warned early Thursday afternoon. • The center of the hurricane was about 150 miles southeast of West Palm Beach, Fla. as of 1 p.m. Thursday, moving northwest at 14 m.p.h. over the Bahamas. The eye of the storm was projected to hit Cape Canaveral at about 8 a.m. Friday, and pass near Jacksonville at about 8 p.m.
• A hurricane warning is in effect from northern Miami-Dade County, Fla., to the Altamaha Sound, between Jacksonville, Fla., and Savannah, Ga.
• New York Times journalists covering the storm include Lizette Alvarez in Port St. Lucie, Fla.; Azam Ahmed and Nick Madigan in Miami; Frances Robles in Titusville, Fla.; Les Neuhaus in Jacksonville, Fla.; Alan Blinder in Atlanta; Richard Fausset and Jess Bidgood in Charleston, S.C.; and Richard Pérez Peña in New York.